This top quality CO2 pest control air rifle kit is full powered and ideal for controlling all kinds of vermin. 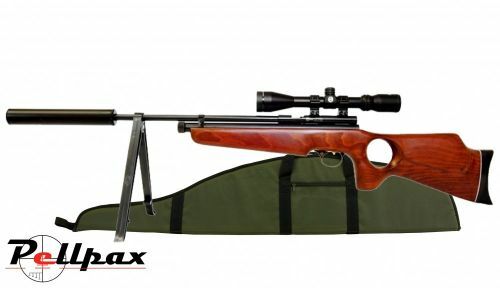 It is based on the top selling XS78 CO2 bolt action air rifle and this model has a superbly comfortable thumbhole hardwood stock. We are also including scope & mounts as well as a Back Draft silencer to reduce the muzzle noise to near silent. We are also adding free of charge one of our Bipods, 10 Co2 Capsules, some hunting pellets, and of course the scope will be fitted and zeroed by us in our warehouse so you can start hitting the mark as soon as it arrives. Finally, a top quality fully padded gun bag to keep your rifle protected at all times.. Perfect for rat busting! Total length - 100.5 cm / 39.9"
Barrel Length - 54.5 cm / 21.5"